Ring brooch, gold, made from sheet and filled with pitch (the pitch is visible where the engraving breaks the surface), engraved and enamelled. Traces of a reddish-brown enamel on both the obverse and the reverse; traces of paraffin wax consolidant. The reverse is engraved with a wreath of bows and pine sprigs. Lightbown, Ronald. 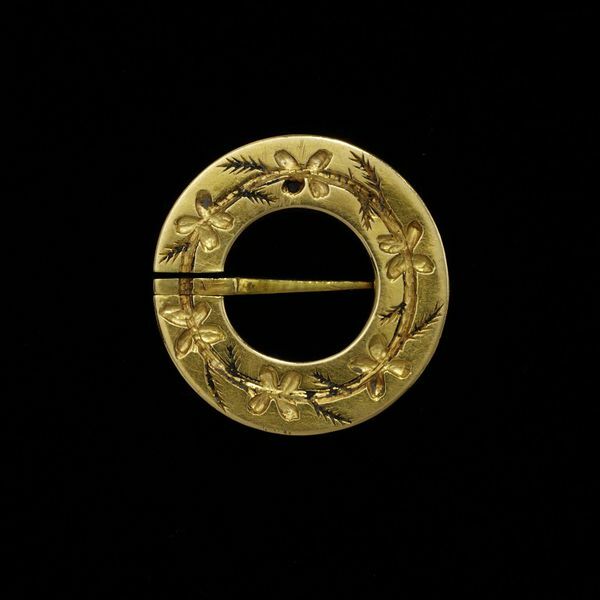 Medieval European Jewellery: with a catalogue of the collection in the Victoria & Albert Museum. London: Victoria & Albert Museum, 1992.